Oh the teacher’s lounge… it can be such a great place, yet such a black hole of gossip. So much good and collaboration can take place in a teacher’s lounge, but more and more I just hear and see it used for a place of gossip and badmouthing. I get it. You have rough days, we all do. And as teachers, we naturally enjoy collaborating with others. So when we have a rough day, we want to tell someone about our rough day to get it off our chest before we go home… because we certainly never take our work home with us. But I’m not here today to talk about my extreme dislike of all things teacher’s lounge (unless there’s free food). 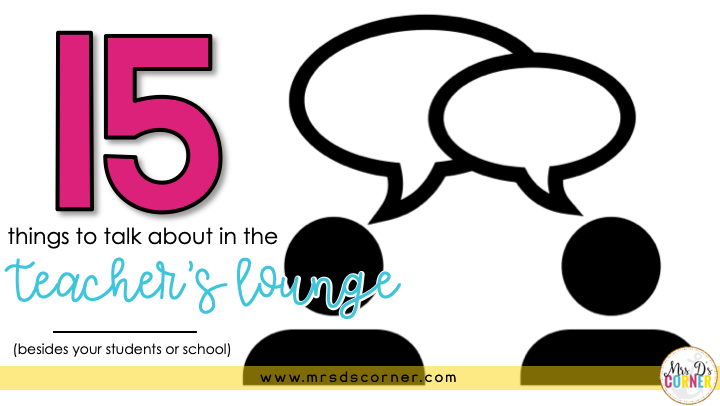 I want to share with you 15 different things you can talk about in the teacher’s lounge besides your students, other staff, or anything school related. So what can you talk about in the teacher’s lounge? 1. Last week’s episode of Saturday Night Live. DID. YOU. SEE. THAT?! Or maybe it’s about that old skit of Justin Timberlake and Jimmy Fallon at camp again… share away! Or the hilarious commercial you saw last night. 2. Summer plans, or weekend plans… or any kind of plans you have. And yes, binge watching Netflix while eating an entire gallon of ice cream in one sitting is still considered a plan. What kind of ice cream are you going to have? What about toppings… ooohhh! Toppings! 3. Or talk about the new show that you’ve been binge watching on Netflix. How many times is Netflix going to ask you if you’re still watching? LOL! 4. That one time in high school where you fell walking up the steps … in front of the entire school. Or that time a bird pooped on your head at recess in fifth grade and you had to wash it out in the bathroom. We all have our horror stories from grade school… share! Let’s bond over our own embarrassment! 5. Anyone reading a good book? What is it? What’s it about, and do you think you’d like it too? 6. The cutest thing that your pet did last night. 7. The newest diet fad going around. Or 30 minute recipe ideas, like hamburger biscuits. You could maybe even plan a potluck lunch! Or some easy and healthy teacher snacks. 8. Funny things your own children say and do at home. Share videos and pictures, and just laugh over all of the silly, yet lovable things our own children do to make life interesting. 9. Maybe you bought something really cool on Amazon the other night and you’re so excited to share about it. It’s kind of like show and tell, but for grown adults. Ha! 10. Talk about make up and hair stuff! 11. Summer vacation plans… spring break plans… ANY plans you have! 12. You could talk about how you prep for lessons and materials at home. What supplies do you keep on hand at home to help you prep, like your file folder laminator or your spring loaded scissors. Share your tips and tricks! 13. Everyone’s got them… talk about your crazy relatives. Lovingly of course. 14. Does anyone have a wedding coming up? Is anyone having a baby? Share your stories and excitement, talk about the wedding or the upcoming little one. What else would you add to this list to create a positive teacher’s lounge experience? Tell us in the comments below! Great Things to Talk About in the Teacher’s Lounge..